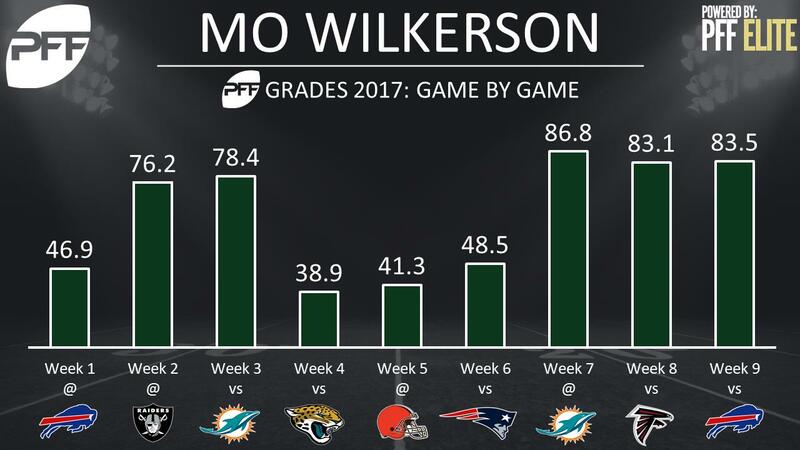 After a three-game slump where his highest-graded game was 48.5, New York Jets interior defender Muhammad Wilkerson has put together a solid three-game stretch, posting an overall grade above 80.0 in each contest. In Weeks 4, 5, and 6, Wilkerson struggled against the run, posting a run stop percentage of 4.3, tied for 69th among 85 qualifying interior defenders. He recorded three total stops (constitutes a ‘win’ for the defense) in that period, tied for the 42nd-most among 85 qualifying interior defenders. However, in Weeks 7 and 8, Wilkerson ranks 19th among 86 qualifying interior defenders with a run stop percentage of 12.2. His six stops are tied for the third-most among interior defenders in that stretch. Wilkerson had success rushing the passer against the Bills in Week 9, notching five total pressures (one sack), awarding him with a pass-rush productivity (measures pressure created on a per snap basis with weighting toward sacks) of 11.4, the highest of all interior defenders.